The paper Southeastern South Dakotans have depended on since 1934. JULY 26, 2011 VOLUME 78, NUMBER 30 Presorted Standard US Postage Paid Permit #32 ECRWSS Yankton, SD Printed on Recycled Paper Postal Patron Local 201 W. CHERRY • VERMILLION, SD 57069 • Phone: (605) 624-4429 • FAX 605-624-2696 • www.broadcasteronline.com D Da on’t ys Mi s in this s Cr Do Sa az Ya wnt turd y nk ow ay ton n . FURNITURE & FLOORING s, mp s, La e All ctur ries f Pi sso of ce 0% Ac to 8 20 FREE 4 ALL MATTRESS vent E Twin Mattress only $ WE MAKE THE WORLD’S BEST MATTRESS.™ Full Mattress Queen Mattress only $ 124 12 Mo nth on Any s No Intere s $499 w Purchase O t ver / appr oved c OR Ca redi sh Dis count t Availa ble only $ 149 Our Guaranteed Lowest Price, Plus up to $388 in FREE Giveaways SAVINGS UP TO 90% ON SELECT ITEMS - 2 Weeks Only Discontinued - Slightly Damaged - Outdated - Mismatched FREE Local Delivery & Setup.................................$39 FREE Disposal of Old Bed......................................$20 FREE 12 Month 0% Financing................................$64 FREE Ultra Plush Pillow..........................................$60 FREE Mattress Protector........................................$69 FREE $100 Hatch Gift Card..................................$100 (to use on other merchandise) Spend $499-$689 & Receive Top 4 $183 TOTAL VALUE FREE Spend $699-$1498 & Receive Top 5 $268 TOTAL VALUE FREE Spend $1499 & Up and Receive Them All! 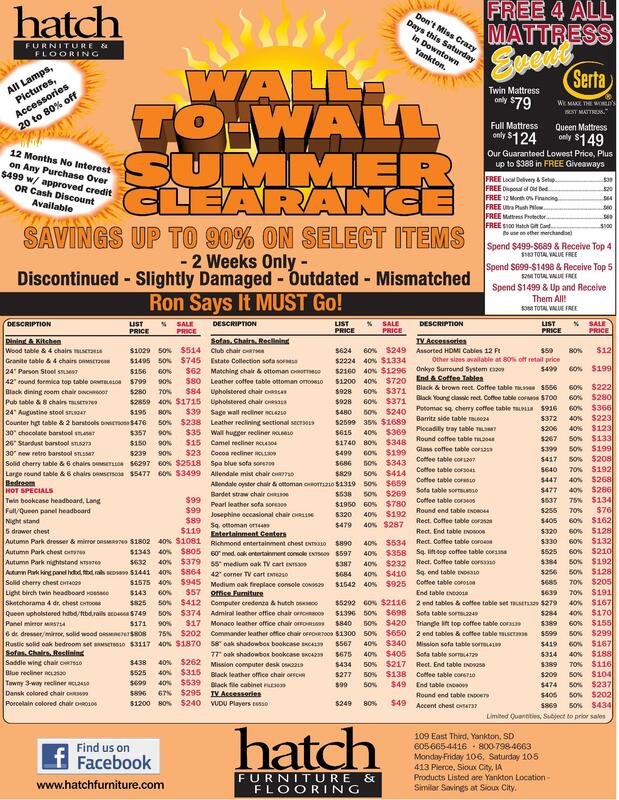 Ron Says It MUST Go! DESCRIPTION 79 LIST PRICE % SALE PRICE Dining & Kitchen Wood table & 4 chairs TBLSET2616 Granite table & 4 chairs DRMSET2698 24” Parson Stool STL3697 $1029 $1495 $156 50% 50% 60% 42” round formica top table DRMTBL6108 Black dining room chair DINCHR6007 $799 $280 90% 70% $514 $745 $62 $80 $84 $1715 $39 $238 $35 $15 $23 $2518 $3499 Pub table & 8 chairs TBLSET9769 $2859 24” Augustine stool STL9247 $195 Counter hgt table & 2 barstools DINSET5059 $476 40% 80% 50% 30” chocolate barstool STL4587 26” Stardust barstool STL5273 90% 90% $357 $150 30” new retro barstool STL1587 $239 Solid cherry table & 6 chairs DRMSET1108 $6297 Large round table & 6 chairs DRMSET5038 $5477 Bedroom HOT SPECIALS Twin bookcase headboard, Lang Full/Queen panel headboard Night stand 90% 60% 60% 5 drawer chest Autumn Park dresser & mirror DRSMIR9769 $1802 40% Autumn Park chest CHT9769 $1343 Autumn Park nightstand NTS9769 $632 Autumn Park king panel hdbd, ftbd, rails BED9899 $1441 40% 40% 40% Solid cherry chest CHT4029 Light birch twin headboard HDB5860 40% 60% $1575 $143 Sketchorama 4 dr. chest CHT0088 $825 Queen upholstered hdbd/ftbd,rails BED4668 $749 50% 50% Panel mirror MIR5714 $171 6 dr. dresser/mirror, solid wood DRSMIR6767 $808 Rustic solid oak bedroom set BRMSET8510 $3117 Sofas, Chairs, Reclining Saddle wing chair CHR7510 $438 Blue recliner RCL2520 $525 Tawny 3-way recliner RCL2410 $699 90% 75% 40% Dansk colored chair CHR3699 Porcelain colored chair CHR0106 67% 80% $896 $1200 40% 40% 40% $99 $99 $89 $119 $1081 $805 $379 $864 $945 $57 $412 $374 $17 $202 $1870 $262 $315 $539 $295 $240 DESCRIPTION $388 TOTAL VALUE FREE LIST PRICE % SALE PRICE Sofas, Chairs, Reclining Club chair CHR7968 Estate Collection sofa SOF9810 $624 $2224 60% 40% Matching chair & ottoman CHROTT9810 Leather coffee table ottoman OTTO9810 $2160 $1200 40% 40% Upholstered chair CHR9149 Upholstered chair CHR9319 Sage wall recliner RCL4210 $928 $928 $480 60% 60% 50% Leather reclining sectional SECT3019 Wall hugger recliner RCL8810 Camel recliner RCL4304 $2599 $615 $1740 35% 40% 80% Cocoa recliner RCL1309 Spa blue sofa SOF6709 $499 $686 60% 50% $249 $1334 $1296 $720 $371 $371 $240 $1689 $369 $348 $199 $343 $414 $659 $269 $780 $192 $287 Allendale mist chair CHR7710 $829 Allendale oyster chair & ottoman CHROTT1210 $1319 50% 50% Bardet straw chair CHR1996 Pearl leather sofa SOF6309 Josephine occasional chair CHR1196 50% 60% 40% $538 $1950 $320 Sq. ottoman OTT4489 $479 Entertainment Centers Richmond entertainment chest ENT9310 $890 60” med. oak entertainment console ENT5609 $597 40% 55” medium oak TV cart ENT5309 42” corner TV cart ENT6210 $387 $684 40% 40% Medium oak fireplace console CON9529 Office Furniture Computer credenza & hutch DSK9800 Admiral leather office chair OFFCHR8009 $1542 40% $5292 $1396 60% 50% Monaco leather office chair OFFCHR1699 $840 Commander leather office chair OFFCHR7009 $1300 50% 50% 58” oak shadowbox bookcase BKC4139 77” oak shadowbox bookcase BKC4239 Mission computer desk DSK2219 $567 $675 $434 40% 40% 50% Black leather office chair OFFCHR Black file cabinet FILE3039 TV Accessories VUDU Players E6510 $277 $99 50% 50% $2116 $698 $420 $650 $340 $405 $217 $138 $49 $249 80% $49 40% 40% $534 $358 $232 $410 $925 DESCRIPTION LIST PRICE TV Accessories Assorted HDMI Cables 12 Ft $59 Other sizes available at 80% off retail price Onkyo Surround System E3209 $499 End & Coffee Tables Black & brown rect. Coffee table TBL9988 $556 % SALE PRICE 80% $12 60% $199 60% $222 $280 $366 $223 $123 $133 $199 $208 $192 $268 $286 $134 $76 $162 $128 $132 $210 $192 $128 $205 $191 $167 $170 $155 $299 $167 $188 $116 $104 $237 $202 $434 Black Young classic rect. Coffee table COF8898 $700 Potomac sq. cherry coffee table TBL9118 $916 Barritz side table TBL6024 $372 60% 60% 40% Piccadilly tray table TBL3887 Round coffee table TBL2048 $206 $267 40% 50% Glass coffee table COF1219 Coffee table COF1207 Coffee table COF3041 $399 $417 $640 50% 50% 70% Coffee table COF8510 Sofa table SOFTBL8510 $447 $477 40% 40% Coffee table COF3605 Round end table END8044 $537 $255 75% 70% Rect. Coffee table COF2528 Rect. End table END5008 Rect. Coffee table COF0408 $405 $320 $330 60% 60% 60% Sq. lift-top coffee table COF1358 Rect. Coffee table COF53310 $525 $384 60% 50% Sq. end table END6310 Coffee table COF0108 End table END2018 $256 $685 $639 50% 70% 70% 2 end tables & coffee table set TBLSET1329 $279 Sofa table SOFTBL2249 $284 40% 40% Triangle lift top coffee table COF3139 2 end tables & coffee table TBLSET3938 Mission sofa table SOFTBL4199 $389 $599 $419 60% 50% 60% Sofa table SOFTBL4729 Rect. End table END9258 $314 $389 40% 70% Coffee table COF6710 End table END8099 Round end table END0679 $209 $474 $405 50% 50% 50% Accent chest CHT4737 $869 50% Limited Quantities, Subject to prior sales www.hatchfurniture.com FURNITURE & FLOORING 109 East Third, Yankton, SD 605-665-4416 • 800-798-4663 Monday-Friday 10-6, Saturday 10-5 413 Pierce, Sioux City, IA Products Listed are Yankton Location Similar Savings at Sioux City.